The word out on the street is that I simply do not own or or know how to use a tape measure, level or square. The truth is I have plenty of each. I do know how to use them too. They get used a bunch - where and when necessary. The rest of the time they stay in the tool box. We build to a visual standard and much of what we build simply can't be measured. Most of what we do is built by eye. 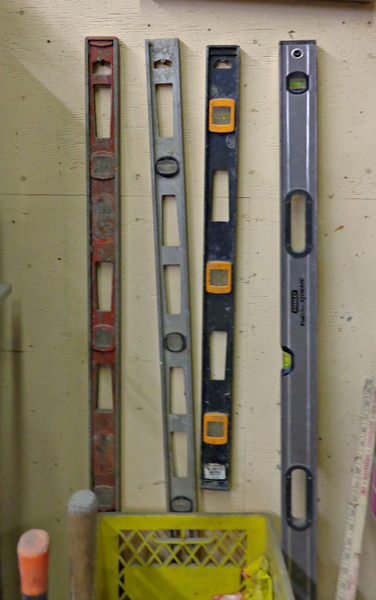 Our levels, squares and tape measures are primarily used for structural components and foundations. Even there it is often necessary to build off kilter or in a curve - ON PURPOSE. Squares, levels and tape measures are not very useful for those things. My dad who worked as a carpenter when I was growing up was much fussier about level, square and measured everything twice before cutting. He did his best to train me right too. When I started my own business he often gave me a hand. Each time we started a new project he would give me a shiny new square and often a level too. This went on for many years. In 2003 when we built our new shop I dug out all of those squares and levels he gave me. Three or four are still used on a regular basis and are stored handy by my tool box. The rest I hung on the wall above. The next time he dropped by he saw all of the levels he had given me and decided I really had enough. He also decided he would never get me to use them more often than we did. I simply didn't do things the way he did.